Using Antwerp Blue and French Ultramarine Blue I laid in some color for the pillows. The light source is coming from above, so I used the darker pigments closer to the bottom of the pillows, and used the lighter, more wet pigments near the top. 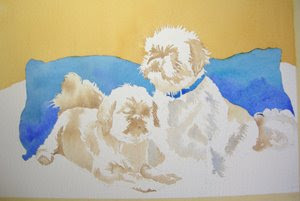 I'll add texture and details to the pillows at a later stage of the painting. Right now, I just want to develop relative values throughout the composition. I used the same colors to create the collar for Scooter, on the right. If you are enjoying this lesson, please become a Follower! See the link at left.